Heleborus Niger. It is also called Setter-wort, Setter grass, Bear's-foot Christmas-herb, and Christmas- Rose. It has fair green leaves rising from the root, each of themstanding about a handbreadth high from the earth; each leaf is divided into eight or nine parts, dented from the middle of the leaf to the point on both sides, abiding green all the win�ter; about Christmas, if the weather be temperate, the flowers appear upon footstalks, consisting of five large, round, white leaves a-piece, sometimes purple at the edges, with many pale yellow threads in the middle; the seeds are divided into sev�eral cells, like those of Columbines, but are larger, they are black, long, and round. The root consists of numberless blackish strings, all united into one head. They are found in some woods. It is an irritant poison, although sometimes given medicinally. In large doses both black and white Hellebore are drastic purgatives; in smaller doses, they are diuretic and emmenagogue. They are principally used as purgatives in case of mania, melancholy, coma, dropsy, worms, and emmenagogue. It ought not to be given except under skilful direction. 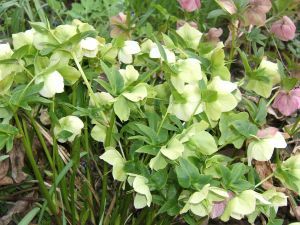 The Helleborus Foetidus, Stinking Helle�bore is given to expel worms; the dose of the Powdered Leaves being for a child 4 to 20 grains, or a fluid ounce of the decoction. The Helleborus Viridens, Green Hellebore, has been employed in America as a remedy for typhus fever, and for some convulsive diseases of children. But its administration requires both skill and great care.